Tasklets wrap functions, allowing them to be launched as microthreads to be run within the scheduler. That is the most common way of launching a tasklet. This does not just create a tasklet, but it also automatically inserts the created tasklet into the scheduler. There are two especially notable tasklets, the main tasklet and the current tasklet. The main tasklet is fixed, and it is the initial thread of execution of your application. Chances are that it is running the scheduler. The current tasklet however, is the tasklet that is currently running. It might be the main tasklet, if no other tasklets are being run. Otherwise, it is the entry in the scheduler’s chain of runnable tasklets, that is currently executing. The main tasklet factors into the stackless.runcount value. If you are checking how many tasklets are in the scheduler from your main loop, you need to keep in mind that there will be another tasklet in there over and above the ones you explicitly created. This class exposes the form of lightweight thread (the tasklet) provided by Stackless-Python. Wrapping a callable object and arguments to pass into it when it is invoked, the callable is run within the tasklet. In fact, the tasklet.__init__ method just calls tasklet.bind() and the tasklet.__call__ method calls tasklet.setup(). Note that when an implicit tasklet.insert() is invoked, there is no need to hold a reference to the created tasklet. Note that the tasklet cannot be run until it has been provided with arguments to call func. They can be provided as args and/or kwargs to this function, or through a subsequent call to tasklet.setup(). The difference is that when providing them to tasklet.bind(), the tasklet is not made runnable yet. func can be None when providing arguments, in which case a previous call to tasklet.bind() must have provided the function. If a tasklet is alive, it can be rebound only if the tasklet is not the current tasklet and if the tasklet is not scheduled and if the tasklet is restorable. bind() raises RuntimeError, if these conditions are not met. Note that when tasklets have been bound to a callable object and provided with arguments to pass to it, they are implicitly scheduled and will be run in turn when the scheduler is next run. Insert a tasklet at the end of the scheduler runnables queue, given that it isn’t blocked. Blocked tasklets need to be reactivated by channels. Remove a tasklet from the runnables queue. If this tasklet has a non-trivial C-state attached, Stackless will kill the tasklet when the containing thread terminates. Since this will happen in some unpredictable order, it may cause unwanted side-effects. Therefore it is recommended to either run tasklets to the end or to explicitly kill() them. If the tasklet is alive and not blocked on a channel, then it will be run immediately. However, this behaves differently depending on whether the tasklet is in the scheduler’s chain of runnable tasklets. What you see here is that t1 is not the only tasklet that ran. When t1 yields, the next tasklet in the chain is scheduled and so forth until the tasklet that actually ran t1 - that is the main tasklet - is scheduled and resumes execution. If you were to run t2 instead of t1, then we would have only seen the output of t2 and t3, because the tasklet calling run is before t1 in the chain. Removing the tasklet to be run from the scheduler before it is actually run, gives more predictable results as shown in the following example. But keep in mind that the scheduler is still being run and the chain is still involved, the only reason it looks correct is tht the act of removing the tasklet effectively moves it before the tasklet that calls remove(). While the ability to run a tasklet directly is useful on occasion, that the scheduler is still involved and that this is merely directing its operation in limited ways, is something you need to be aware of. Similar to tasklet.run() except that the calling tasklet is paused. This function can be used to implement raw scheduling without involving the scheduling queue. The target tasklet must belong to the same thread as the caller. What you see here is that the main tasklet was removed from the scheduler. Therefore the scheduler runs until it got interrupted by a keyboard interrupt. Raise an exception on the given tasklet. exc_class is required to be a sub-class of Exception. It is instantiated with the given arguments args and raised within the given tasklet. In order to make best use of this function, you should be familiar with how tasklets and the scheduler deal with exceptions, and the purpose of the TaskletExit exception. If you try to raise an exception on a tasklet, that is not alive, the method fails, except if exc_class is TaskletExit and the tasklet already ended. Changed in version 3.3.7: In case of an error Stackless versions before 3.3.7 raise exc_class(*args). Later versions raises RuntimeError. Raise an exception on the given tasklet. The semantics are similar to the raise keywords, and so, this can be used to send an existing exception to the tasklet. if pending evaluates to True, then the target tasklet will be made runnable and the caller continues. Otherwise, the target will be inserted before the current tasklet in the queue and switched to immediately. If you try to raise an exception on a tasklet, that is not alive, the method raises RuntimeError on the caller. There is one exception: you can safely raise TaskletExit, if the tasklet already ended. Terminates the tasklet and unblocks it, if the tasklet was blocked on a channel. If the tasklet already ran to its end, the method does nothing. If the tasklet has no thread, the method simply ends the tasklet. Otherwise it raises the TaskletExit exception on the tasklet. pending has the same meaning as for tasklet.throw(). # Implement unsafe logic here. Note that this will also prevent involuntary thread switching, i.e. the thread will hang on to the GIL for the duration. Rebind the tasklet to the current thread, or a Python® thread with the given thread_id. This is only safe to do with just-created tasklets, or soft-switchable tasklets. This is the case when a tasklet has just been unpickled. Then it can be useful in order to hand it off to a different thread for execution. The relationship between tasklets and threads is covered elsewhere. This attribute is True while a tasklet is still running. Tasklets that are not running will most likely have either run to completion and exited, or will have unexpectedly exited through an exception of some kind. This attribute is True when a tasklet is alive, but not scheduled or blocked on a channel. This state is entered after a tasklet.bind() with 2 or 3 arguments, a tasklet.remove() or by the main tasklet, when it is acting as a watchdog. This attribute is True when a tasklet is blocked on a channel. This attribute is True when the tasklet is either in the runnables list or blocked on a channel. This attribute is True, if the tasklet can be completely restored by pickling/unpickling. If a tasklet is restorable, it is possible to continue running the unpickled tasklet from whatever point in execution it may be. All tasklets can be pickled for debugging/inspection purposes, but an unpickled tasklet might have lost runtime information (C stack). For the tasklet to be runnable, it must not have lost runtime information (C stack usage for instance). Setting this attribute to True prevents the tasklet from being blocked on a channel. This attribute is the id of the thread the tasklet belongs to. If its thread has terminated, the attribute value is -1. In almost every case, tasklets will be linked into a chain of tasklets. This might be the scheduler itself, otherwise it will be a channel the tasklet is blocked on. The previous tasklet in the chain that this tasklet is linked into. The next tasklet in the chain that this tasklet is linked into. The following attributes are intended only for implementing debuggers, profilers, coverage tools and the like. Their behavior is part of the implementation platform, rather than part of the language definition, and thus may not be available in all Stackless-Python implementations. The trace / profile function of the tasklet. These attributes are the tasklet counterparts of the functions sys.settrace(), sys.gettrace(), sys.setprofile() and sys.getprofile(). 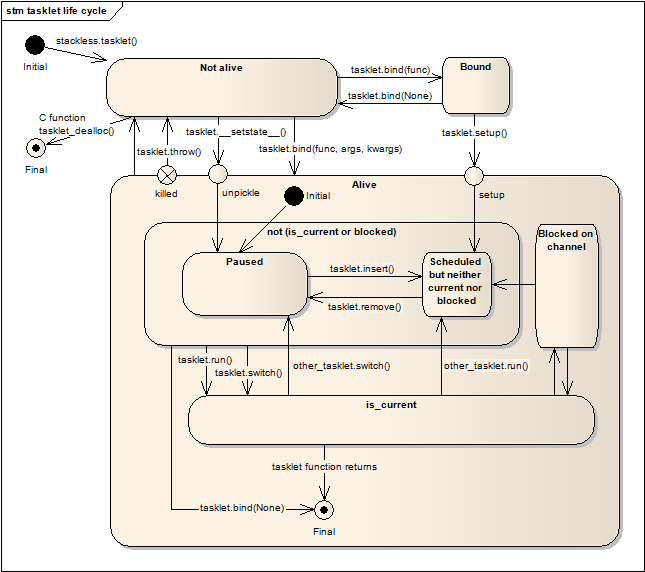 Here is a somewhat simplified state chart that shows the life cycle of a tasklet instance. The chart does not show the nesting-level, the thread-id and the flags atomic, ignore-nesting, block-trap and restorable.